We've reached the next important milestone in our quest to releasing a game, and it's called Zero Bugs. As of the 15th, we have zero bugs in our bug lists. That's not to say the game has zero bugs (far from it), but we fixed everything, and if we didn't fix it because it wasn't that important, we closed it. Testers continue to test and file bugs, but the rule now is at the end of each day, there are zero bugs in the bug database. We also take a hard look at the bugs coming in and decide whether to fix it or not. Sometimes the bug isn't that critical or it's an edge case, so we just close it. Other bugs are just too dangerous to fix and they aren't that important. If it was 2 months ago, we would fix it, but not now. It's important to clarify what we mean by bug. If something crashes the game, or makes the game unplayable or is painfully ugly, it's a A bug and we fix it. If it's just something that makes the game a little glitchy and it's not common, that's a B bug and we'll fix it if there is time and it's a safe fix. Bugs that are unlikely that anyone would even notice or are rare edge cases, those are C bugs and usually just get closed. We had a bug where sometimes (rarely) an actor would face the wrong direction when you gave them something. Fixing it would touch a lot of code and there was a high likelihood of breaking other code, so we opted to not fix it. It the kind of bug you might see once in an entire playthrough. We had another bug where the input and cursor were being turned off for a split second to keep the player from messing up a special-case animation, but a bug caused the input to be turned on prematurely and left on during a cut-scene. It's an edge case, but the consequences catastrophically break the game, so we had to fix that, despite needing to touch a lot of code to do so. Testers still continue to report everything and we triage all the new bugs each day. The thing about fixing bugs is, anytime to fix a bug, there is a likelihood you'll introduce a new bug, so we don't want to just keep fixing. The goal is to get a completely stable version where testers aren't finding any A or B bugs anymore. The only way to accomplish that is to lock the code down as much as possible. We want to say there will be no bugs in the game, but that's just not realistic. The game has close to 100,000 lines of code and that is only the game code, not the engine. It's a complex beast. There is a point where you have to say: we're done. If you don't, you never finish. That is the real reason for these milestones: to force us to make hard decisions and move on. Now, all that said. The Zero bugs relates to the game code, there are still several open bugs related to the engine and platforms, but there don't affect the game. An example of one of these is, when you scale the screen for safe mode, garbage shows up along the edges. That has nothing to do with the game code, and is purely an engine issue, so it's low priority. There are 10 or 20 such bugs, but we decided to focus on the game related bugs first. I also have a big memory leak I need to find and fix. It's not the kind of memory leak a leak detector will ever find, it's memory the game is holding onto because it thinks it needs to, but doesn't. That's going to take me a few days of lock-myself-in-a-room-debugging to find. There are also a lot of issues with the Xbox port, mostly related to Microsoft's cert issues, but that's probably a whole ‘nother blog post. Amazing to hear about all those milestones! I am so hyped for the game! Good to hear that! I suppose there will be online updates to the game, so nothing is lost if some critical bugs are overlooked. But how did you handle releases back in the days when you couldn't just throw out a patch because all those floppys were out, Ron? Uhh.. interesting question, I never really thought about that. We tested really well and with a lot of testers. Also, games like MI are filled with bugs. 90% of them no one notices. Come to think of it, yeah! When i used to play those fan made games on AGS it always baffled me why MI or MM never crashed or did something really stupid. How curious. We never encountered any kind of bug in "Monkey Island 2" during multiple playthroughs. The first time I saw a bug was in "Day of the Tentacle" (once) and then "Sam & Max" was riddled by bugs. Anyway, I'm sure TWP will be stable. Good luck, thanks. It's twenty-six years, Mr. Gilbert : isn't it time to fix these issues ONCE AND FOR ALL!? Don't underestimate the fans. I found quite a lot of them, I think. How many percents would you say those are? - The line "The basic theory is fine." of the Fettucini Brothers is skipped due to a script error. - Smirk's cigar's smoke positioning is off. - Guybrush occasionally refuses to burn the cereals, even after the journey to Monkey Island and vice versa. It is possible to get stuck here if you didn't bring anything else to burn. - The Piranha poodles freeze briefly before eating the meat. - Ghost key cloning by repeatedly using the compass on it while in Lechuck's room. - Storekeeper walks through mid-air when shortening the first open safe cutscene early. - "Use pewter wad with ???" can cause an error if it disappears from inventory, but the command isn't executed yet, ie. Guybrush is still walking to the target object. - Guybrush doens't seem to have a clue when inspecting the rubber chicken, even after he has used it on the cable. - Picking up yellow flower is not animated, eventhough one of the default animations would do perfectly fine here. - Firework colors and lightning effect are missing in all VGA versions. - Jolly Roger still visible on the mast after cooking it. - Voodoo antiroot crate requires the tools when opening it again. - Voodoo antiroot crate comment "I don't see anything special about it. Except that big glowing voodoo antiroot inside. ", even if Guybrush already grabbed it. - Storekeeper's comment on Guybrush pretending to wait tables, has a line skipped due to a script error. - Estevan's fear eye animation is missing in all VGA versions. - The porthole defogger does not decrease the price when opted out, which is the 0 entry in an array which was only initialized from 1 on. - The swordmaster is invisible (while going into the house and closing the door) after showing the kidnapper's note. - There are some goofs in the Herman dialog script letting him or Guybrush say things at the wrong time. - The small lights at Stan's shed are not animated. The animations are there, but the script to actually animate them is simply missing. - Smirk's cigar has no smoke at all in the close up. - Animal notice with bad background color making it much harder to read. - Quite a few actors and texts have wrong colors due to palette changes in the enhanced CD version: Talk colors for the navigator, Estevan (glass eye in SCUMM bar), Bob and the ghost priest (which even has 3 different colors), sentence line when dead under water and during the auto sequence in the Governor's mansion, Dialog selection in the upside down text at the circus, in the close-up for the navigator and the final close-up with Elaine and Guybrush, and finally Guybrush skin and hair when he's dying. - The "Still ten o'clock"-joke was messed up. - "Jam. Rum." appears in the wrong location. - "Use" the helmet at the circus doesn't work anymore. "Give" is the only way here. - Navigator very rarely looks to front or back when it should. Guybrush also comments acordingly when looking at the the navigator. This makes finding the way much harder than it was before. - On the Sea Monkey, dripping water animation speed. - Use cereals while they are still in the cupboard with something causes a fatal error in the DOS version. - Yellow petal is green at Stan's. Among other color glitches in the inventory. - Random swordfighting pirates have all the same colors. - Various costume graphics have less colors as on the regular VGA version. - Shaking animation of grog machine is missing. - Too bright costume palette in some rooms. - Torch colors in jail. - Lamp in mansion light color. - Colored corner at the sign on the banana tree. - Walking off path after visiting Sword Master's. - Verbs flashing between rooms in hell maze. - command line boot parameters don't require the debug mode anymore. Not sure if that was intentional, but it requires the debug mode activated in all other SCUMM games. Of course, the vast majority of them are rather harmless, and I bet, you would call them C bugs indeed. I can make a similar list for Monkey 2, if someone is interested. That's a great list. A lot of people hold MI up as a "perfect" game, but it was filled with bugs and other stupid stuff. All games are. If the vertical castling wasn't considered a bug, why did they feel the need to fix it then? It's pretty common in sports, once an undefined or unsettling situation is encountered, they fix it in the rules. I didn't know about vertical castling. This is amazing, thanks! I'm sorry but most of those are from VGA or even SE version. You can't bad-mouth MI! There is no SE exclusive bug on that list. Since it uses the same resources the enhanced CD does, all SE exclusive bugs are in fact introduced by the interpreter itself. I didn't even list interpreter bugs here, but only bugs in the resource files. Oh I mixed that up. So it was the VGA and VGA CD versions. All those "enhanced (CD version)" stuff made me think of the Special Edition. Speaking of SE: How come they didn't realise that stool is missing and draw it in? Maybe it was because of switching between classic and SE (and they didn't want to change the original files). In the EGA version the chair was at its place, and it disappeared in the VGA version. So, simply, the artist who redrew the background forgot to put it in. Then some artist had to redraw the background for SE, so he took the background and -since there's not a chair there- he simply dind't have a clue taht a chair was missing. Because you have to see the characters in place to realize there's something wrong. Notice how the chairs are all gone when the bar is empty later on in the game? This is due to the chairs being part of the animated character objects. Maybe we are missing some plothole here, since having the chairs in the background graphics really seems obvious, yet they aren't for some reason. So, the error was more subtle. In the VGA version somebody had drawn the character without the chair. THIS is strange. How can you mistake that? Quite normal that the mistake wasn't recognized in the next version. Yes, the stools are part of the animation in EGA. In the Ultimate version it's really fixed! 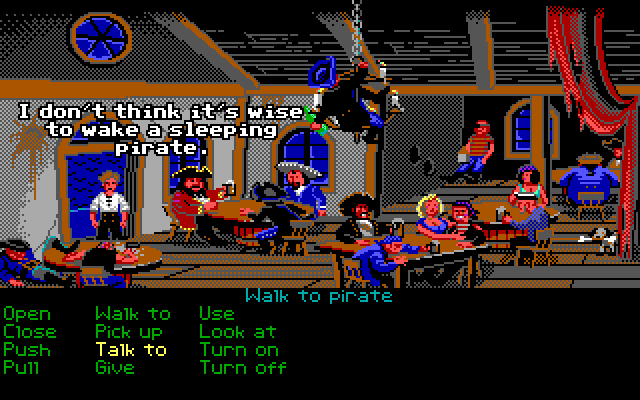 Also it's the same with all the other pirates in the SCUMM Bar so I don't know how they could miss this (both VGA and SE). 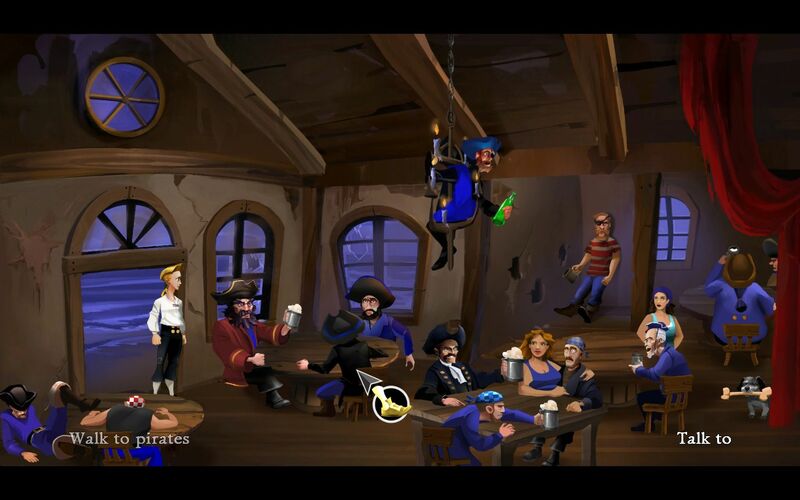 Thank you for creating these ultimate versions of Monkey Island 1 and 2! They are awesome! Especially with MI1:SE I was disappointed that the voiceover wasn't working in classic mode (gladly they made this right with MI2:SE). I have played both games using your fixes and had no problems (well, I didn't know of most of the original bugs anyway, but Spiffy the Dog alone is a reason to use this version!). My congratulation, man! I feel a newbie compared to you!! Uhhh... wow. It takes a special kind of talent to find these things, I hope you use it well. In deed, I did. As mentioned, they are all fixed in the Ultimate Talkie Edition. I played a version where in the ship you could burn the directions to reach Monkey Island, and I then got stuck because I couldn't give them to the cannibals to get the navigator's head. It was fortunately solved in a later version. Interesting list! Please post the one for MI2 too! Ohhh, how come I've never noticed? Ahahah, that's true!! I have never noticed it, I thought his clothes covered his chair! In this version (click link on my name) the stool is present. I wonder if it is the second edition (not special edition). Oh come on, this is the original EGA version, how couldn't you recognize it? It has as many colours as the EGA version of Zak! According to LogicDeLuxe' list it seems like they introduced quite a lot of bugs with new VGA and VGA CD versions they made later, especially missing stuff (stool, signs...). Although I would have thought the stool is part of the background, how could they forget it? Err... I am using Windows 95 in EGA version, so, I didn't notice the difference. The VGA version is also able to run in EGA. It applies realtime dither in 640x200. Doesn't look too bad, imho, but is rather slow on weak machines. As far as I know, Ron wasn't responsible for the CD version, as it was done when Ron had already left Lucasfilm. - When begging for the bucket, the man still looks like he's sleeping. - Polishing the pegleg is supposed to get as much money that you just get one piece of eight too little. You can easily defeat that mechanism by returning some stuff at the shop you bought earlier. Of cause, no one seriously playing this would ever encounter this. It is more like an easter egg, but a buggy one. - Bloody Lip music and laundry music can start while Largo's theme is still playing. - At Stan's, the direction Guybrush is currently facing is not taken into account. If you do things in a certain order, that will lead to Guybrush pointing away when he is meant to pointing to the coffin. - Graphic glitch when offering something to Dread and then talking to him. - There is a dialog option at Dread's ship which is never available due to a script bug. "You know, I used to go out with Governor Marley." - The gambler's club tells you the next number, even before Ralphy played the last one. Yet, he tells you that he fixes only one number at a time. - The water animation freezes on Dreads ship when looking at some inventory items. - Lights stop flickering while Largo is at laundry. - "Dem Bones" could hang after the first verse. That is very rare, but I've seen this happening. - Voodoo bag sound does not stop when you interrupt the cutscene while she is shaking the bag. - "Pull rope" in Dinky Island when it is already in the inventory can cause various issues, including the game terminating with a script error. Interestingly, this bug was fixed in the German version. Maybe Boris did this. - Looking at Dread's map, Big Whoop map or Dem Bones lyrics at Rum Roger's can cause a script error. - There is a script that would let Dread bring you back to Scabb and leave. It is supposed to trigger as soon as you have all 4 map pieces, but one of the map pieces doesn't adjust the variable it checks for. - At Stan's, some colors are wrong, leading to some ugly black pixels. - If you change rooms too fast, it is possible that the Scabb music won't stop on Dread's ship. - I've also seen a video where the swamp music does not play, and Guybrush gets stuck in the hut's entry due to the script waiting for a music cue (which in this case never comes). I've never managed to get this bug myself, though. - Guybrush's shirt color changes during the diving scene. - At Dinky beach, Guybrush can fill the glass with water without picking it up first. - In the final chapter, the time you'll have a chance to react when LeChuck appears depends on the text speed. If you have set the text very fast, you also have to click very fast, which can be frustrating, if you don't know how to avoid this issue. - Using the voodoo doll inside the lift interferes with other scripts. That is why LeChuck never shows up when waiting in the lift. However, he does show up, if you don't have the voodoo doll yet. He has to, since it is the only room you can get his beard. However, if you are fast enough, you can just build the voodoo doll when he appears and use it, causing the bug. - The paper of the wanted poster suddenly seems to be in much better shape when you put Kate's flyer on it. - The cook at Marley's mansion has some lines in the script which are never played. They must have noticed this when recording the SE, since they skipped those. There are some occasions where looping sounds suddenly stop, which are not actual game bugs, but limitations in the iMuse engine. It is most noticeable at the water fall. As with Monkey 1, those are fixed in the Ultimate Talkie Edition. I think I've only really encountered the first one. And then there was this duplicate pipe thing with the fisherman which was even mentioned in dialog. Maybe a bug they encountered but fixed in a creative way? Hey, I was playing seriously! I wonder what are the skipped lines of that cook in the mansion? I've seen a video where someone did the polishing thing. And the missing lines are not actually skipped like those cases in Monkey 1. It is in a script which is never called, iIrc. I don't remember the words, I just noticed this while sorting the samples. Probably not that interesting, or I would have remembered it, I guess. I've seen you have fixed missing spoken numbers when talking to Stan in MI1! Do you remember script(/interpreter) differences in MI2 at start on the beach when singing "100 bottles of beer on the wall"? In my memory you could select random numbers in the original MI2 version. In SE and Ultimate there are always the same selections and it doesn't count down all the way down from the bigger number, which is a shame. The scripts in the original resources were not altered in the SE. All changes like "100 bottles of beer" and all the censoring is hacked into the interpreter itself. I had to heavily edit the "100 bottles of beer" script to actually adapt the changes made for the voice recordings into the original resources. I went even further and sync'd the singing to the background music, which the SE didn't. However, the counting down is not changed at all. They still count down as low as 2 before Fink shouts a new number. The thing is, they didn't voice all numbers, and replaced any unvoiced numbers with mumbling. If you set subtitle mode to "keep original text" in the Ultimate Talkie, you can still see the numbers counting down. The random numbers had to go, obviously, since it would lead to instant mumbling most of the time, which would be rather boring. Really, I'm speechless. Even better than the SE, congratulations. "- The water animation freezes on Dreads ship when looking at some inventory items." Yes, I remember that! I remeber I have noticed it only the first time I have played MI2, because on the next times I didn't look into the inventory anymore! "- Guybrush's shirt color changes during the diving scene." That's normal... or not? Don't colors change while in water? "- In the final chapter, the time you'll have a chance to react when LeChuck appears depends on the text speed. If you have set the text very fast, you also have to click very fast, which can be frustrating, if you don't know how to avoid this issue." Great discover!! This one can be turned into an interesting cheat! Again, congratulations for your bug-tracking and devotion! Guybrush's shirt color: I think the problem was that there was another shirt colour while diving down but when moving around in the ocean it changed back. Thanks for this two interesting buglist! Santa would help out by delivering new floppy disks! Hi Ron! Jesus! what a huge amount of work are you doing guys! What happen if you find a bug you can´t fix? did that already happen? greetings from Argentina! PD: When are you going to release a playable demo ?? As far as I remember, they told in a Friday Questions Podcast that they never had a bug which they weren't able to fix. There won't be a downloadable demo version. They have a demo only for certain events such as PAX. will the bug repair stopp after release game? Have you some plan for the time after? Depends on the bug. As I mentioned above, fixing a bug can introduce new bugs, so we don't want to just fix bugs post launch. If it's an A bug, we'll fix it, but probably not B and C bugs. I noticed it and thought you would have some paranormal explanation for it, or that it would be some kind of mystical never unrolling toilet roll patented and trademarked of course. But then I realised I couldn't actually tell which way the toilet roll was hanging anyway if it was creased out of view from beneath. C bug or not, I still like the spinning animation. Most of all I now really want to try pulling and pushing it to see if it will unroll. The roll seems to have a freewheel, which can rotate in one direction only, for the sake of convenience. It's a professional quality product from the 80s. It just rotates due to the repulsion when the paper is pulled off. That's something I thought about too. And yes, I understand that's a C bug... as long as you have no puzzle to unroll to the floor. Maybe that paper is just very sticky. You never know what's there in such a filthy place. Ive been following Ron and David on Twitter for a long time now. And it is hard not to notice that you are not fans of Donald Trump (nor am I, for that matter). But my concern is that you once stated in a podcast, that you will put certain things into the game, that will have some sort of reference to modern times. But are you planning a reference to Trump? Because the next 4 years we will hear his name daily (sigh). So I just think a reference to his name in the game will only envoke a sigh, and make me think of today, and not 1986, which is a time I only think of fondly. Since the project has already passed the milestone "content complete" the election result will not have any influence on the contents of the game. We don't make any jokes about specific people or events post-1987. We do make some jokes about the future, but they aren't specific. I did make a general joke about the first woman president in 2017 that I will remove now (sadly... on a lot of levels). That 2017 woman president joke could have been fun. On the level of the Ronald Reagan joke from Back To The Future. But Trump.... yeah, I have heard way too much about him. Seriously: almost every single head line the last year have been about him. And think about how it will be in 4 years....Trump overload. Leave the joke in the game. 2. We can dream of a better world. I agree. Leave it in and let us dream. Or maybe just change the year to 2021? I played Zak McKracken And The Alien Mindenders many times, and I gave it a 10/10 vote. But one day, David Fox told me that even Zak had some bugs left, but I have never noticed. Anyway, what is the next milestone, now? I lied. Absolutely zero bugs in Zak. Oh... I thought David spoiled the game, but maybe he lied about the spoilers as well? I guess you aren't counting the shuttle bug. Congratulations on hitting that milestone. I'm definitely looking forward to playing the game. The screen shots are definitely bringing back fond feelings from playing classic games. With the updates to the images, it probably better reflects how I remember them, not how they actually were. But that's what I wanted anyway. Thanks for another interesting look inside development! Thank you for the blog post, Ron! I used to work as a bug tester for Sony PlayStation, and a Class A was for anything that made the game incompletable, Class B was for anything glaringly ugly (graphical corruption, sounds messed up, etc) but which didn't stop the playing completing the game, and Class C was for anything superficial that was neither of the above. Thinking about it makes me want to test for TP! I think Brian Fargo said it best: "Don't put bugs in the game, you'll only have to take them out later". Right, I had forgotten about that. You do know they don't belong to bugs (=insects)? Yes, I do know that, but I just wanted to advertise a superhero that I like. Ron, I'm curious whether you have any sort of automated testing to check for those bugs that might be introduced when fixing another one? Coming from a web development background we do a lot of unit and integration testing to avoid regression when refactoring or bug fixing, but I'm not sure how well that works in a game environment. It's hard in game dev. Everything is so fluid and unpredictable, due to players. The testers just go though and regress the bugs. I would make sense for the engine though. First time I see fogbugz used somewhere else. How is that working out for you guys? Ron, I'm interested how many lines of code had got Maniac Mansion on C64? Congrats on reaching zero bugs! Looking forward to playing the game. "There is a point where you have to say: we're done. If you don't, you never finish." I must engrave this sentence and put it on my desk. I AM READY TO PLAY THIS GAME NOW, SO I AM. 4 Days? You'll have that fixed in 4 hours! Yep, understand about all of that. Sounds like you are making good decisions. The only way TWP can fail now, 1. if you have a delayed day 1 release. 2. If you break peoples saves. 3. Black screen bug for people with Nvidia cards. 4. Change the name of the game to "TWP, Trump Won Polls"
Ron, what's the worst bug you've encountered during your career and approximately how many hours did you spend fixing it? Lip-sync is already implemented, using rhubarb-lip-sync. We only have a few test lines, but once all the dialog is in, I'm sure there will be bugs. Wow, that's great news! I can't wait to see the first lip-sync'ed video clip! Let me know if there's any way I can help you. If you have any questions or run into problems, just send me an e-mail or create an issue on GitHub! Wohoo, you made it! Nice! Congratulations! It's great to hear that your brilliant work got rewarded! Wow! I didn't think you would have time to do that. That's great news. Looking forward to basking in the wonder of lip-synced animations with the final release. Loved your first proof of concept art! Which software/service do you use for bug tracking? Seeing that they responded, they may have made an exclusive offer for him. Also his tweet doesn't necessarily imply he wouldn't use it again for the next game. He will just drop it when TWP is done because it wouldn't be necessary anymore AND costs quite a lot per month. If he'd make his next game with 5 people or less it costs $20/month + $10/month per add-on (the cheaper ones), with original pricing. But 6 to 10 people would already cost $100/month + $50/month per add-on which is quite a step! You're right. Even if he would like to use it for his next game, he won't need it until playtesting begins - after about one year. And here you are right: Until playtesting they don't really need it at all, i.e. they can use the in-house tool again with the core team. Aaand since TWP will be a huge success the next game will be an adventure game anyway, so Ron can keep working with Gary, David & Co who are already trained with those tools. P.S. Very interesting commentary, Mr. Gilbert. I wonder if you have plans on correcting at least some of the "B" bugs in a future "service patch"? Or is the team taking the position that once released the game is frozen in time FOREVAH? ...which is actually likely to be delivered this year, sooo.... hurry up Thimbleweed Park Team!! Broken Age? Is there some temporal anomaly causing a three-year offset between you and the rest of the world? No time anomaly, not this time. I'm a Kickstarter backer and the Kickstarter bigbox + Blu-ray documentation is still pending! Strange... so you backer did not play Broken Age yet, while who had purchased his copy in steam, like me, had already a chance to play (and finish) it? We've got the digital version of game and documentary of course. But not the bigbox (here is a mockup: https://twitter.com/TimOfLegend/status/775855500852211713 ) and not the remastered documentary on Blu-ray. All (well, quite some) glory to the playtester(s). It is one thing to find many bugs which the ordinary OCD-guy would do as well. It is something completely different to even notice a subtle bug that surfaced just recently after the 17th play through. Even in my own games I wouldnt even realize (or mind) if the main characters were replaced by pink elephants at that point. For memory hog se use gperftools in draconian Mode, with some scripting you can filter the verbose output. Hi from Spain. that's good news. I don't want nothing on 2017 but playing this game. I had the opportunity as a kid to play your games 25 years ago. The magnitude of MM and MI, broke the distance barriers in a time where games were mainly propagated through consoles. I see the Thimbleweed Park not just as a chance of playing your games again, but for a whole generation that started in the primordium of personal computer, watching the development tells us a lot about the software history. Nowadays we are experiencing a era of innovation, where a huge mass of people want to create web applications and spread their ideas and solutions through software. 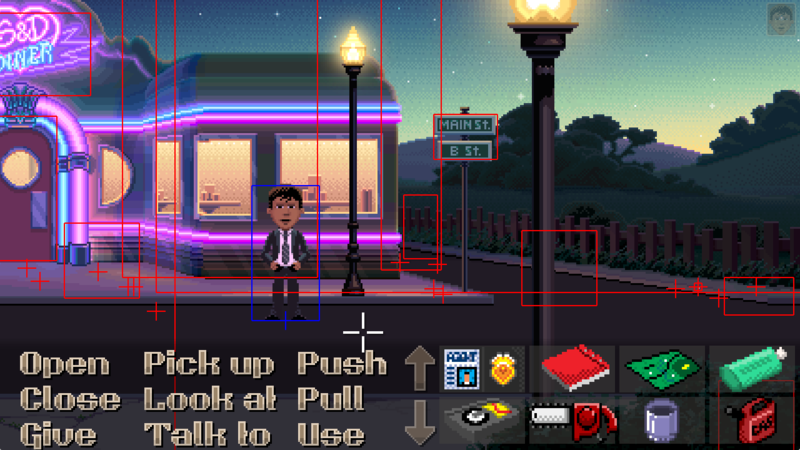 Im sure Thimbleweed Park Blog could be a nice "hint book", not just about software development, but even more about creating a Digital Products of Success. Thank you for all that fun stuff that you create. Best use of the word "primordium" in the blog comments so far, in my opinion. Hello Ron, I'm still really worried about the different pixel sizes and pixel mis-aligning. In AGS, resolutions get mixed up only if you play using old settings; that shouldn't happen normally. There will be a pixel perfect mode, but, the pixel alignment issue you see are on purpose and very intentional. It's not that I'm not paying attention, I'm paying very close attention and doing it this way. It's not a bug that I'm waiting to fix. I like it this way. Remember, you're only seeing screen shots, once you see it in motion, I am confident that pixel perfect mode will be something you turn on as a curiosity and then turn it off. The important thing to remember at the pixel art is, we're not doing it to be retro, we're doing it because we love the aesthetic, but not the technical limitations. If you're looking for a game that slavishly adheres to the limitations of the 80s, this is not that game. Thank you very much for the answer and your time Ron. I can not express myself well in english, it's not my mother tongue, I did not intended to be rude on the way of saying my previous message, sometimes I'm afraid I sound rude when I try to express my worries, sorry if it was the case. That said, it's an honor only the fact being responded by you. You are a living legend to me, you are a childhood hero to me. I have fond memory of my father introducing me to Monkey Island 2 as one warm memory of my childhood. You are doing an amazing job. Please when you finish this game do another one. I'll collaborate in Kickstarter the second after I see a project by you in Kickstarter. I cannot stress enough the amazingness of your games. When I saw the first screenshots of TWP many months ago, I missed pixel perfect alignment, but today, when I see the videos, I agree with you that you get used very quickly to the way it is, because the art is still pixelated. Moreover, there are some modern effects which would look awful if they were pixel perfect. Nevertheless I think that it would have been conducive to the pixel perfect mode to ensure equal resolutions for any artworks, so that the inventory icons don't have a lower resolution that the verbs, for instance. The main screen will be pixel perfect (if selected), the verbs and inventory will not. I'll just state that up front. They are two completely different graphics elements and all the verbs are hand drawn and we can't draw two sets of verbs in 5 languages. Also, the resolution of the main screen (rooms) changes from room to room (close, med and long shots), and the UI and inventory can't change with it, or we'd need 3 inventory icons and another 3 sets of the verbs permutations.. I'm sorry if this disappoints anyone, but we want to make a game using the amazing aesthetic of pixel art, but didn't want to beholden to technical limitations. Just trying to be upfront and transparent. Personally, I'm not very disappointed, since I think that the player notices it only if he looks twice, and, developing this game has been elaborate enough, even without those technical limitations. I never missed any technical improvement when I was playing MI 1 & 2, but it's not carved in stone. Moreover, we have bigger screens nowadays. And, it may be a bit more difficult to attract younger gamers, if the entire game was in 320x200 for the sake of nostalgia. Seeing that Axiom Verge zooms in and out, I assert that TWP is much more in proper style. Well, I admit that Axiom Verge is also fine, and zooming is extremely seldom there. Nonetheless, zooming was not common back then. I've first thought the UI defines the pixel raster and the rest will just be rendered to that raster when in pixel perfect mode. But I guess forcing those different room sizes to such raster would look really bad, hence you are doing it this way. Moreover, it would have meant a huge amount of work for the team. By forcing I meant the rendering of the scene, not creation. I would image it looked too ugly and thus dismissed. Gotta say, this kickstarter project is a dream compared to most. Well done fellows ! And congrats to the whole team. Here's to ya'll enjoying the fruits of your labour. Pixellated Jay-Z says "diggin' this"
Have you noticed that the chainsaw is a bit bigger than the box where it is? C bug maybe? Btw. are the inventory icons even final? Who knows! I suggest a 4x3 pixel mode. Guaranteed aspect ratio and pixel perfection. Oh, maybe even 10 bit per pixel then? Would love to see this blog post about the MS cert process :-) ... interesting stuff! I'm happy we have live streaming from AdventureXpo this year! Man, you're writing a lot of bugs but what i wanted to say is that the toilet paper is wrongly attached, it needs to be inverted. Actually I'd adjust the previous statement so that the verbs are balanced with the neon sign and the inventory but as the rest of the scene is bit darker , overall they do pop a bit. I suppose you might want to look at particularly dark and bright scenes and maybe adjust the verbs/inventory just slightly, so that it's not very noticeable that it was adjusted. hey i gonna report a BUG. i am gonna restart the game because of this bug. İ need to feed Clown the Ransome's hamster. But the cheese dissapear from the refrigerator. know i can't take popcorns from the rats. and i am stuck ! I just put the cheese in front of one of the holes, waiting for something, then i moved out or inside, cant remember, and when i came back and check...i couldnt find the cheese anymore. Went back to the refrigerator and was empty ! Please, im stuck here, dont know what to do. İ need to feed Clown the Ransome's hamster. But the cheese dissapear from the refrigerator.